My second week of training has been logged, and I'm starting the third week feeling good! I had one bad run, one good run, and one totally fine, run-of-the-mill run (hah, pun). Sunset action from my office Monday evening. Tuesday: 6.5 miles (3x2400m) on the local bike/running path. The mountains never look as big in pictures as they do in real life. They make me so happy. Woke up absolutely dreading leaving my bed but determined to get this run done. Run went fantastically and I was so glad I did it and didn't have the workout looming over me the rest of the day. Dynamic stretching (always! I'm becoming so good about this!) prior to heading out then a nice slow mile to warm up before hitting the mile-and-a-half repeats. The pace felt easy and strong till midway through the last repeat, when my breathing was off from a short but steep hill and I was running into a fairly strong wind (nothing crazy but by the third mile of running into it, I was over the resistance). 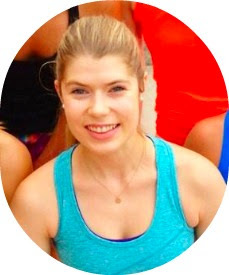 Wednesday: Strength with Melanie (Equinox trainer). Thursday: 5 miles easy (~9:47 avg pace) on the treadmill. It was a long day at work again,but I definitely needed the mental break. I listened to Serial while running. If you're at all into listening to things while running, it's a great podcast. Super addictive. Anyone else listening to it? Sourabh and I always discuss it for a good couple hours over the course of the week after each episode is released. Perks of being in the office at 7am = gorgeous sunrises! I was having some major neck/shoulder tightness and pain, so I took advantage of Massage Envy's $49 first-timer special and their 10:00 pm closing time. She also loosened up my legs a bit which was nice! Saturday: 6 mile Tempo on the treadmill + Strength with Melanie. Collapsed in pile of pain from random side ache. Argh. This run. I felt SO badass after running six miles at an average 8:24 pace last week. Each mile got easier, oddly enough, so I assumed this run would go smoothly. Hah. I wasn't in a great space mentally -- I was tired from a looooong work week -- but I was still excited to challenge myself again. However, midway through the fourth mile, I started having a side ache. I hopped off, stretched, and kept going. By midway through the fifth mile, the pain had turned stabby. I spent the last half mile hopping on and off, continually stopping the treadmill. I really wanted to get to six miles but had to give up at the end of the fifth. I was so bummed at this run, but thankfully I was meeting with Melanie right after, and she reminded me that rest and recovery was much more important than two miles. I suggested I try the last few miles after our session and she asked me what mattered more -- proper recovery or two miles logged eleven weeks out from race day. Obvious answer is obvious. I just wanted to curl up and do this after this run. His chubby belly in this picture slays me. Two sets of 15 reps of four core exercises (two exercises before and two after, bookending the other strength exercises). Two sets of 15 reps of five total body exercises (squat to press, assisted pull-ups, one-legged sit-to-stands, etc). The one-legged sit-to-stand exercise was by far the most challenging but I loved it -- I'd highly recommend it as both a strength and stability training exercise. It's exactly what it sounds like: go from sitting to standing with one leg out, without flailing around to get yourself up (which is what I did the first couple times). View from the top of my two mile hike with Mason on Saturday. Sunday: 75 minute yoga class. I finally made it to a yoga class at Equinox. I didn't love everything about it (I'm extremely picky about yoga classes), but did appreciate how focused on form the instructor was without making us hold poses for eight hours. I felt like I gained some good takeaways on alignment which I always appreciate. Rest of my Sunday was spent lunching and seeing the new Hunger Games movie with a friend (Jennifer Lawrence is too goddamned talented. Stop it. ), working to get everything squared away for our deal closing the following morning (which it did, woooooo) and frantic cleaning before my parents arrive today. My parents are visiting for Thanksgiving week and I am super excited! I'm running a Turkey Trot on Thursday and we'll be doing some local traveling. I'm going to be adding in long runs starting this week -- also exciting! There are so many trails and pathways here that I can't wait to explore. Anyone else turkey trotting? Who's training for a winter race? It really was SO good! I forgot about your side cramps at SoBe. I'll have to try that exhale-foot trick next time. Awesome workouts!! PS. I'm SO jealous of those mountains, these NYC bridges just aren't as pretty!